Who We Are... Wood Tree Swings was founded in 2007 by North Carolina native Deron Morrow, a 70-year-old retiree with a lifelong passion for woodworking. All Wood Tree Swings are hand-crafted one at a time in America with attention to superb quality, safety and durability. Our Wood Tree Swings, made with sturdy, weather-protected wood that is sanded and features rounded corners, strong ropes, a 30-day, money-back guarantee, a lifetime warranty and are shipped within 24 hours of order processing. Customers around the globe --- from Australia to Europe to America --- have discovered that Wood Tree Swings are the perfect gift for children, families, schools and churches. Check out our popular Toddler Swing! Wood Tree Swings has a swing for everybody. Using computerized precision carvers, we can personalize your swing with names and images. Some swings are engineered with unique safety features that address the needs of select disabilities. Environmentally friendly, Wood Tree Swings uses recycled materials in packaging, printing and in our popular Tire Swing. Wood Tree Swings can build a custom swing to your specifications -- size, shape, color and use. Please call or email us for a quote: 888-409-2334 and woodtreeswing@gmail.com. Please explore this Wood Tree Swings Website, examine the wood tree swings, and start your journey to a time when life was simpler and pace was slower. The dimensions and color may vary slightly due to the hand-made nature of our items. Small differences in shape, size, color and finish are hallmarks of our craftsmanship, these differences are not treated as defects and actually make your item unique to you. 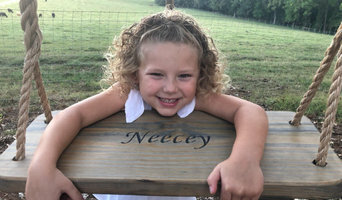 Asheville Playgrounds is North Carolina’s premier design builder of custom, hand-crafted playgrounds and tree houses for parks, schools, churches and backyards. We specialize in architectural theme playgrounds and rustic natural playgrounds for residential or commercial use. We develop each design with your dreams in mind, and hand-build each unique playground with materials that are time-tested for strength, durability and resistance to the elements. These include naturally rot-resistant locust wood, pressure-treated lumber, recycled plastic lumber and composite decking. Then we expertly install each custom creation at your location, anywhere within 750 miles of Asheville. Find an outdoor play system professional on Houzz. Narrow your search in the Professionals section of the website to Mars Hill, NC outdoor play systems. You can also search farther afield for a pro who fits your project’s needs.